This offers an instant bronzing colour while your tan develops over about 8 hours. Available in Hawaii (light), Ecuador (medium), & Brazil (dark). This innovative anti age spray tan contains HyH2O Technology to fight signs of ageing including fine lines, wrinkles and dryness. Incorporating Odour Remove™ technology for zero smell, Moisture Locking System for 72 hour hydration and certified organic botanicals for intense skin conditioning, the solution dries instantly on your skin for the most comfortable tanning experience, develops to a natural golden tan, and fades away perfectly after 4-7 days. Blacketts Retreat offers Vita Liberata professional tanning to suit every skin type and tone, guaranteeing the ultimate tanning experience every time that fades perfectly back to nothing without you even noticing. From their Irish base Vita Liberata created the world's first odourless tan in 2007 and their unique Odour Remove technology is now present throughout the collection. In 2011, they became the first completely non-toxic tanning brand free from parabens, perfume, alcohol and all chemicals of concern. They are the self tanner of choice for the world's top spas. Natural and certified organic approved extracts are key to the formula. Offering a conditioning skincare treatment that also tans the skin is the goal, giving you a flawless skin finish that combines natural looking colour, velvet soft skin and long lasting hydration. We recommend you obtain a patch test, if you have never used any self-tanning products before or have sensitive skin at least 48 hours prior to your spray tan. It is essential to carry out gentle exfoliation in prior to your spray tan in order to remove dead skin cells. Vita Liberata Super Fine Skin Polish- Moisturising Exfoliator is a great product to use, otherwise choose a good quality product as it's a worthwhile investment. Shop around to find a product that is effective and suits your skin. On the day of your treatment DO NOT wear any make-up, deodorant, perfume, body oils or lotions as these may react with the tanning agents in the spray tan and cause patchiness or discolouration. Relax whilst your professional therapist guides you through your treatment. First the Janine will ask you to wear sticky soles that temporarily adhere to the bottom of your feet. These will stop your feet discolouring. Janine will then prepare your skin with an oil-free moisturiser, applying over your hands, knees, elbows and feet to ensure your spray tan blends naturally. Your spray tan will then be expertly applied. The whole treatment lasts less than 15 minutes. Immediately after your spray tan we recommend you allow a few minutes for the tan to absorb before dressing. 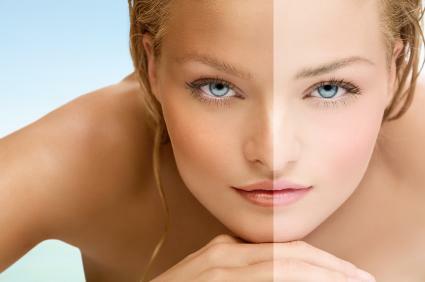 The spray tan will be odourless and initial tan colour you'll see is actually the cosmetic guide colour. Wear loose, dark clothing, sandals or flip flops as it may stain light and certain fabrics initially.